Recognizing a problem that engineers are facing and developing a solution has been Aldec’s rather straight-forward mantra for going on thirty years now. Aldec launched its Hardware Emulation Solutions (HES) product in 2003, integrating RTL simulation with hardware emulation, and offering hardware and software design teams the ability to work concurrently. 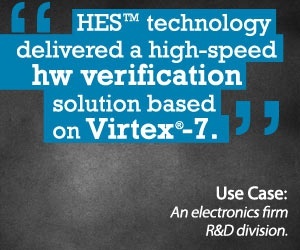 Today HES™ is a fully automated and scriptable HybridVerification and Validation environment for SoC and ASIC designs capable of bit-level simulation acceleration, SCE-MI 2.1 transaction emulation, hardware prototyping, and virtual modeling. These use cases illustrate Aldec’s commitment to work closely with engineers to understand their problems and deliver solutions. Among these problems is rising software costs that are now dominating SoC design. Aldec has partnered with FirstEDA to address these issues in a webinar. This webinar illustrates why FPGAs are chosen as the verification platform for software integration and discuss the challenges of using FPGAs for verification and introduce the use of hybrid virtual prototypes. A comparison is also made between traditional FPGA ASIC prototypes and an FPGA-based emulation system. For more on HES, visit www.aldec.com/products/hes-dvm or contact sales@aldec.com.